Gone are the days when your career can rely on a resume with a 12-pt Times New Roman font printed on a generic white computer paper. Creativity now comes as an essential in resume building but it can’t be denied that not all of us have that kind of skill to make our resumes attractive and eye-catching. You can resort to downloadable templates online but the problem with these templates is that they have been overly used and cannot be fully customized based on your own preferences. What you need is a good resume design with a human touch and this is what a professional resume design service can give you. You select design/layout of your choice. You supply your resume text. Specify your preferences like colors, font and pages. Receive the high quality PDF version on your email. A professional resume design service is not the same as an automated resume service where users upload their own text and automatically receives the document with their chosen design. The problem with automated resume template services is that it can be prone to errors because there are no standards on the length of texts used in a resume. One can have a brief 1 page curriculum vitae while the other might have a comprehensive resume with 2 or more pages of text. With a professional resume design service, there is a real person that will custom typeset the text so that it blends well with your chosen design. This means there are no limitations on the information that you would like to put on your resume because the designers can adjust the text and the design for you. 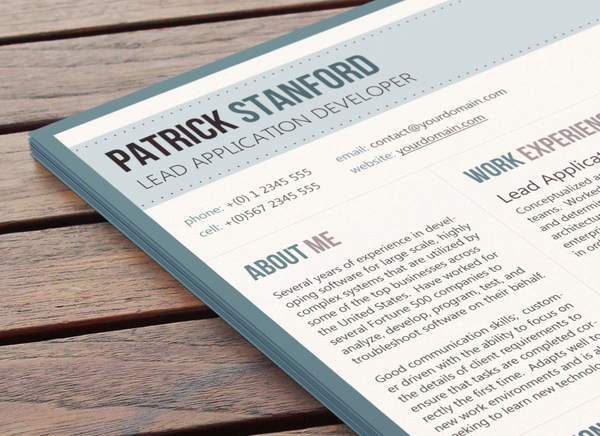 These resume designs have a seamless blend of style, color and function that are sure to get that much needed attention from human resource officers. And since it was individually designed by a professional artist, you can expect the document to be published according to your preferences. Sections can be interchanged and modified while headers or headlines can be changed to create a visually appealing document that is sure to get that second look. Time to stand out from the pile! On average, employers spend less than a minute in reviewing each resume. Perusing stacks of papers can be tiresome and there is a possibility that your application might not get noticed even if you are the most qualified person for the job. You certainly cannot rely on your qualifications and skills written on a plain sheet of document to market yourself to potential employers. This is where you’ll need to have a visually appealing professional resume that will certainly stand out from the pile. So are you still going to rely on a boring resume to find a job? Or maybe you’re still using a resume template that has no human touch? Upgrade your document and sign-up for a professional CV service and enhance your opportunity land your dream job!